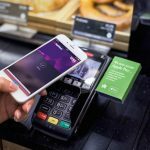 This paper reports on why people use, not use, or have stopped using mobile tap-and-pay in stores. The results of our online survey with 349 Apple Pay and 511 Android Pay participants suggest that the top reason for using mobile tap-and-pay is usability. Surprisingly, for nonusers of Apple Pay, security was their biggest concern. A common security misconception we found among the nonusers (who stated security as their biggest concern) was that they felt storing card information on their phones is less secure than physically carrying cards inside their wallets. Our security knowledge questions revealed that such participants lack knowledge about the security mechanisms being used to protect card information. We also found a positive correlation between the participants’ familiarity with security of mobile tap-and-pay and their adoption rate, suggesting that the participants who are more knowledgeable of the security protections in place are more likely to be using the technology. J. H. Huh, S. Verma, S. S. V. Rayala, R. B. Bobba, K. Beznosov, H. Kim, “I Don’t Use Apple Pay Because It’s Less Secure …: Perception of Security and Usability in Mobile Tap-and-Pay,” to appear in Proceedings of the Workshop on Usable Security (USEC), 2017, 12 pages.